Your brain has a lot to communicate, but when you're working on a computer or playing a game, all of those thoughts gets distilled into a keyboard or gamepad interface that can be limiting to say the least. NeuroSky's new Mindset headset wants to expand your computer-interfacing options by adding EEG brain wave sensory to the equation. I got some hands-on time with the Mindset at GDC to find out if our wildest telekinesis fantasies may finally come true. At first glance, NeuroSky's headset doesn't seem to possess any supernatural features Inside the left earpiece are three steel nodes that fit around the perimeter of your ear, and looping around the headset is another steel receptor that rests against the your forehead. It's far simpler in design than Emotiv's octopus-like grip on your noggin. The Mindset uses these simple sensors to read electroencephalography (EEG) brain waves. These waves transmit data such as a person's level of concentration, anxiety, and drowsiness . At last week's the Game Developer's Conference, several game creators showcased software that use this technology. Among them was Broodin Bash, a multiplayer game where players concentrate on an opponent's limb to attack or focus on their own avatar to defend. All the while players can send text messages to each other in order to distract the other player. Tug of Mind, an iPhone game launching in April, lets you splice into the game the face of a boss or family member that gets on your nerves. The game will then help train you to stay calm in the presence of the person you choose as they hurl insults and slander your way. From my hands on experience with the games, I came away somewhat skeptical of NeuroSky's future. I didn't have reason to doubt the power and accuracy of the technology, but I did feel like the hardware and software lacked tactile sensations and positive feedback to let me know that what was happening on screen was a result of my awesome brain. We've come to expect our computing-interfaces to be predictable and reliable like the press of a button on a keyboard or controller. When slightly imprecise input becomes noticeable, like the Wiimote controller, we can become easily frustrated. However, to NeuroSky's credit, it may be that I'm just not yet used to using my brain in this capacity. Perhaps extended use and training of my brain with such interfaces will eventually result in onscreen occurrences that seem more predictable than they do random. 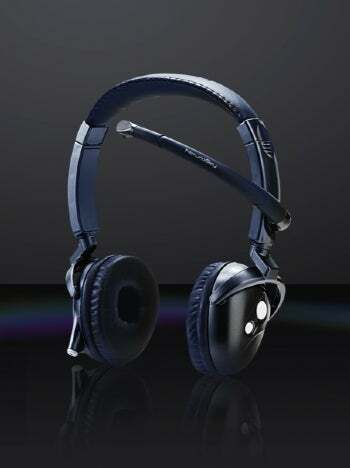 You'll all be able to find out for yourselves later this Spring when the headset launches for consumers.